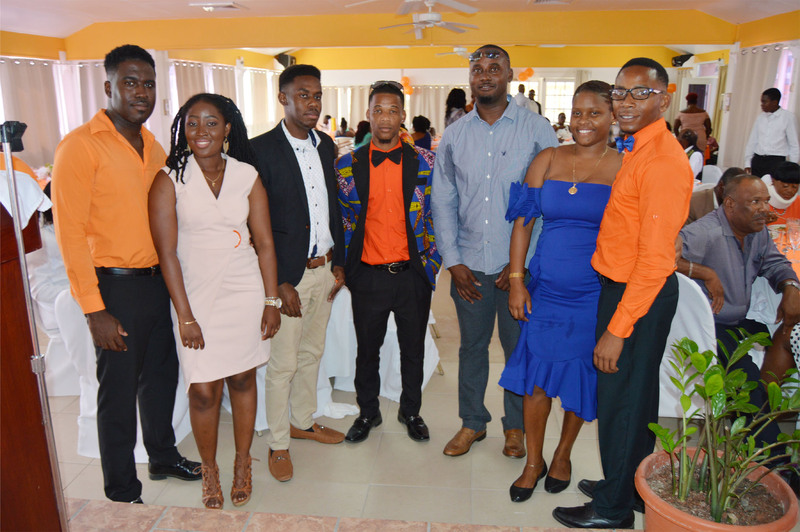 Some of the PLP Youth members, from left: Manasses Huggins, Trevlyn Stapleton, Keith Lewis, Delonte Lewis, Damian Weekes, Tonecia Wattley and Evander O’Flaherty. 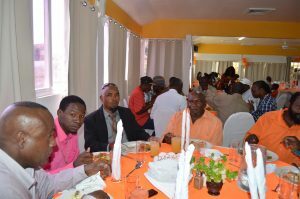 A cross section of fathers and father figures at the PLP Youth Arm luncheon held at the Bird Rock Beach Hotel. Another view of the dining room at the Bird Rock Beach Hotel, where fathers were treated to a Father’s Day luncheon. PLP’s Deputy National Chairman Craig Tuckett addresses the audience at the Father’s Day luncheon at the Bird Rock Beach Hotel. Buffet style luncheon: Fathers and father figures get ready to eat. 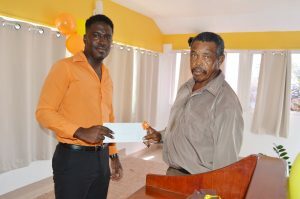 Manasses Huggins presents the winning ticket for a Supreme Suite package at the Bird Rock Beach Hotel to winner Ebenezer Matthew. There was enough food even for fathers-to-be. BASSETERRE, St. Kitts – The Youth Arm of the Peoples Labour Party (PLP) sprang into action and gave fathers a treat on Father’s Day Sunday. 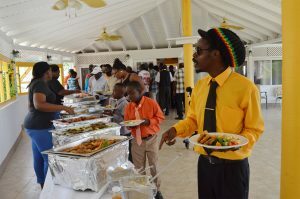 It started with a special Father’s Day church service and culminated with a luncheon where more than 100 fathers, and a number of father figures that included women, were the centre of attention. 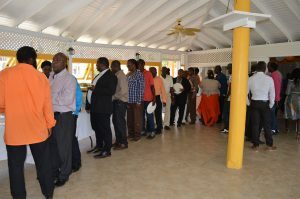 The Father’s Day service was held at the Wesleyan Holiness Church in Molineux, where a record number of fathers attended and were honoured by Prime Minister and National Political Leader of the PLP the Honourable Dr. Timothy Harris, who presented each a certificate of recognition and a token of appreciation. 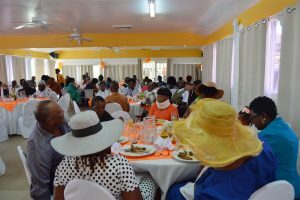 A luncheon was held at the Bird Rock Beach Hotel in East Basseterre. This is the first time the Peoples Labour Party, which is one of the three parties in the ruling Team Unity administration, honoured fathers. Mothers have been honoured on Mother’s Day on a number of occasions. According to Huggins, a planning committee was put in place and they had their first meeting May 28, with a second June 11. Members of the committee included Damian Weekes, the other Youth Arm representative on the PLP National Executive; Roleece Brookes, Tonecia Wattley, Vincia Matthew, Evander O’Flaherty and Trevlyn Stapleton. “The idea came about from the group’s desire to do something special for the fathers throughout our communities to show them that they are appreciated,” Huggins said. The members stayed connected via a WhatsApp chat group, and on the final day were assisted by Delonte Lewis and Keith Lewis, both from the Youth Arm of Constituency No. 5 Branch Executive of the Peoples Labour Partyon. A lucky father was the winner of a Supreme Suite package at the Bird Rock Beach Hotel, which included a free night and breakfast for two at the hotel. To avoid any suggestion of foul play, the committee came up with an ingenious method to pick the winner. As people came into the dining room, they chose where to sit, as nobody directed them. To determine the winner, all present were asked to look for anything stuck under their chairs, and Ebenezer Matthew was the one who pulled out the winning ticket. “We expected the event to be successful, but it was more of a success than we expected,” said Huggins. “I want to publicly thank Pastor Ericson Cumberbatch and the general membership of the Molineux Wesleyan Holiness Church for accepting to host us, and also the Rev. Spencer Watts, district superintendent for the Wesleyan Holiness Church in the St. Kitts and Nevis District, for delivering a timely Father’s Day message. Huggins also thanked the management and staff at the Bird Rock Beach Hotel for hosting them and providing a sumptuous luncheon served buffet style. 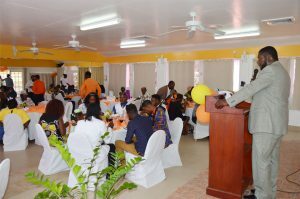 He also thanked PLP’s Deputy National Chairman Craig Tuckett, who represented Harris at the luncheon and who gave an encouraging speech, and Youth Arm Representative for PLP Constituency No. 5 branch executive, and a young father himself, Delonte Lewis, who gave a nice toast to the fathers who attended.